DWP workers doing clean-up tell the story visually. 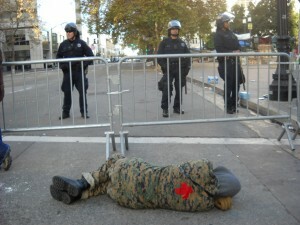 On Monday morning, November 14, 2011, DPW crews in Oakland were at Frank Ogawa Plaza cleaning up the debris from the former site of the Occupy Oakland encampment. 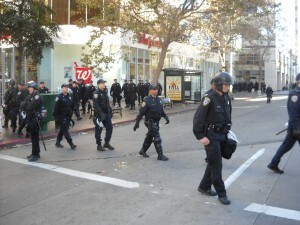 The columnist/photographer observed officers from San Francisco relieving the Oakland PD (in riot gear) on the perimeter of the “crime scene,” sometime between 8 and 9 a.m.
A small number of protesters tried to block the intersection of Broadway and 14th St. A sergeant from the Oakland PD told them they would be arrested. They moved. No arrests could be seen. News photographers and TV crews focused on the DWP workers doing their jobs.